Okay, so I’ve been a little out-of-pocket here lately. Not really out-of-pocket, but just a little busy. It’s been a good busy, but at times, has felt a little overwhelming too. And even though it has been hectic, I wouldn’t trade any of it for the world. A few weeks ago, I was in full on fan girl mode. 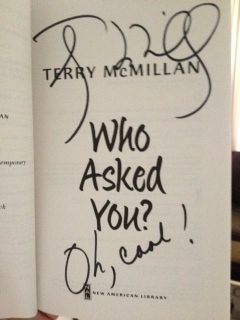 I visited Quail Ridge Books in Raleigh, NC and had the absolute best time listening to one of the authors that inspired me to put pen to paper…Terry McMillan. I couldn’t believe my eyes or ears as I sat there listening to her read from her newest book, Who Asked You? First of all, it’s a great book. She never disappoints me and I learn something new each time I read something she writes. The woman has an amazing way of bringing you into the book and making you feel everything the characters are feeling. Not only is she a talented author, but she has a great sense of humor, has a tremendously awesome personality and is so down to earth. I had a great time and she signed my book y’all! I know, it’s no big deal, right? Yeah, well, it was to me. I even got a chance to tell her she was the reason I loved to write. And when I told her that, she added ‘Oh, cool!’ to her signature. Unreal. I recently attended my family reunion and it was my first time really telling a big group of people I know that I am having a book published. I don’t think any of them really know how special and wonderful it made me feel to have their support and for people to ask me about the book and when they could buy it. It’s becoming more and more real to me everyday and I am over the moon about it. Each day I wake up with the thought “I’m going to be a published author soon” and it still trips me out. I know by now my hubby probably thinks I’m crazy. He had to believe it the day we were riding in the car and I blurted out, “I have a book coming out soon.” I love him though cause he never missed a beat. All he said was “Yes, you do” and kept driving. Gotta love him for that. I guess the biggest lesson I’ve learned in all of this is that no matter what’s going on in your life and how busy you get, always take time to appreciate it all. Appreciate the big things, but especially the small things. Appreciate waking up in the morning. Appreciate the birds chirping. Appreciate the rain. Appreciate the sunshine. It can make for a much more exciting and wonderful life. I am so looking forward to The Christmas Tree Guy! And I’d say your husband is a very sane person, just like mine. All authors need guys like that.